DIY plumbing at home: Do you know the risks? We’ve all fallen in love with DIY television, right? Us too—it makes for some entertaining stuff. Whether it’s renovation reality shows like The Block and Reno Rumble or lifestyle shows like Grand Designs Australia, we just can’t get enough of the ‘knocking down’ and ‘building up’ of homes across Australia. Fixing up the house on the weekends is a proud Aussie tradition, but if the job involves more than cleaning gutters or changing a tap washer, chances are you’ll need the help of a professional. What the DIY reality shows often don’t show you is that many plumbing tasks can be dangerous if attempted by an untrained person. In fact, on most of these popular shows they’ve got a score of qualified tradies on hand to take over from contestants when the job requires it. That doesn’t mean to say keen DIYers need to keep their hands off entirely, it’s just that most of the work we do requires Australian Standard compliance. With over 25 years’ experience in plumbing and gas fitting, we can take over when the job becomes ‘plumber-only’ territory. But remember, unfortunately in our experience Mondays are a plumber’s busiest time—rescuing DIYers from botched weekend plumbing work. While it is legal to change old washers and shower heads on your own, older taps, showers and plumbing can be difficult to work with, posing a real risk to the health and safety of yourself and your family. In NSW only licensed plumbers are allowed to do work in the areas of water supply, gas fitting, drainage, roofing, mechanical services, sanitary and fire protection. 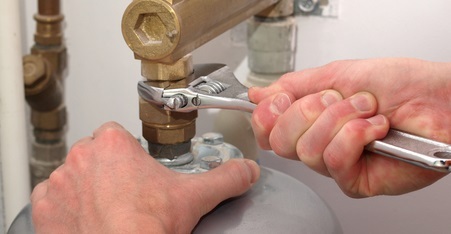 The law protects people from hurting themselves as even experienced plumbers have been known to have serious accidents. DIY jobs can be great learning experiences and one of the best ways to put a little extra pride into your home. Before starting any DIY project, however, make sure you’re working within the law. Not sure what plumbing you can tackle safely? Why not check out our handy guide below. There would be nothing worse than not being covered by law if you need to make an insurance claim for damage to your home. Don’t risk it, contact Curran Plumbing for assistance.